I'm not going to lie but I am in love with the Pop Wash Collection from Color Club. The colours are amazing, they blend together so well, you can build the colour up, and most importantly they are so easy to use. I would probably say that these are my favorite sheer tint polishes that I have tried. 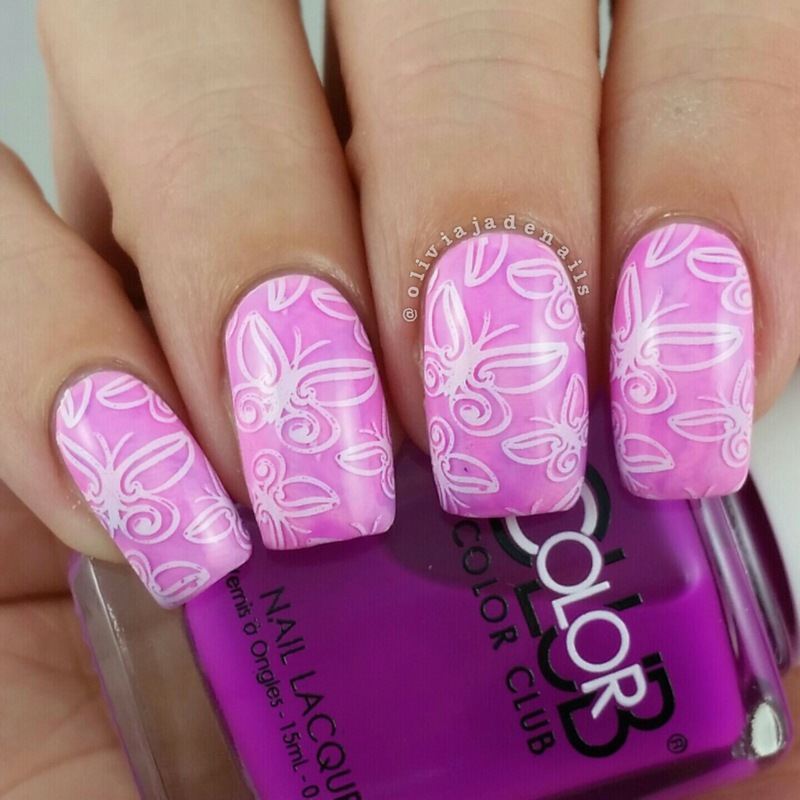 I thought it would be fun to share with you some of the nail art I have done using this collection. I will point out that these polishes are actually brighter and definitely not as washed out as they appear in my pictures. 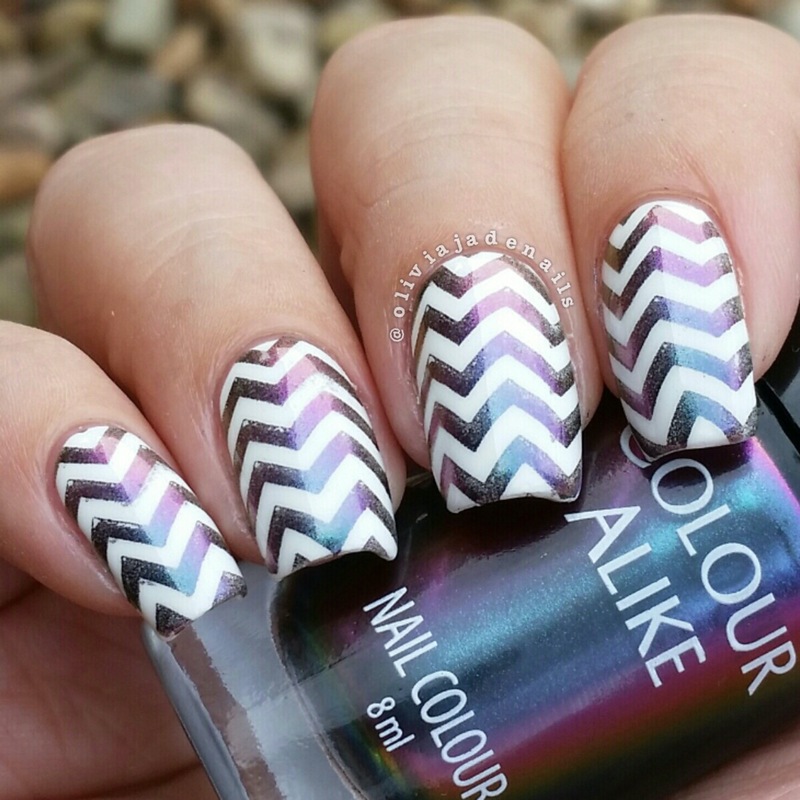 The joys of cameras and bright polishes. You can bet you are going to see me using these polishes a lot. They are just so pretty and so easy to work with. There is just so many things you can do with them. A little back story before I actually get into today's post. Normally when I receive new polishes I sit them in polish racks that live on top of my polish drawers. Once they are swatched they the move into the drawers. It's a good system and works quite well. There are the rare times where the polish racks become too full and then polishes sit on top of the drawers but that becomes too chaotic for me. I can be a little OCD about these things. Anyway, my polish racks became to full so I moved the Color Club Pop Wash's into my drawers thinking I will pull them out later. Somewhere along the lines I took the Pop Wash's out of my blog planner (I move my blog planner around a lot but I rarely take stuff out so no idea what happened there) and forgot about this collection altogether. Luckily I randomly rediscovered them and finally have them to share with you today. Color Club's Pop Wash Collection consists of seven bright coloured sheer tints which are designed to give a "wash" of colour over the nail (these can be either worn alone or over a base colour). Personally I would never use these alone (naked nails and visible nail lines are just not my thing) however, these polishes in nail art are amazing. 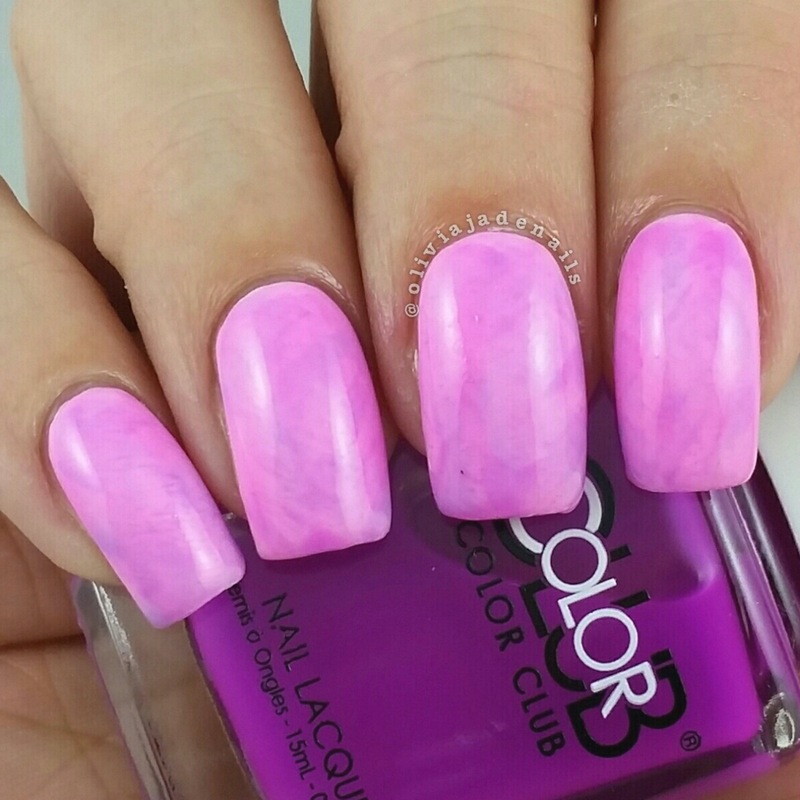 They are so easy to use, they blend well and have a good colour payoff. All of my swatches show two coats over white. Darling Clementine is a bright orange sheer tint. This polish is more orange than it looks in my picture. My camera freaked out completely with this one. 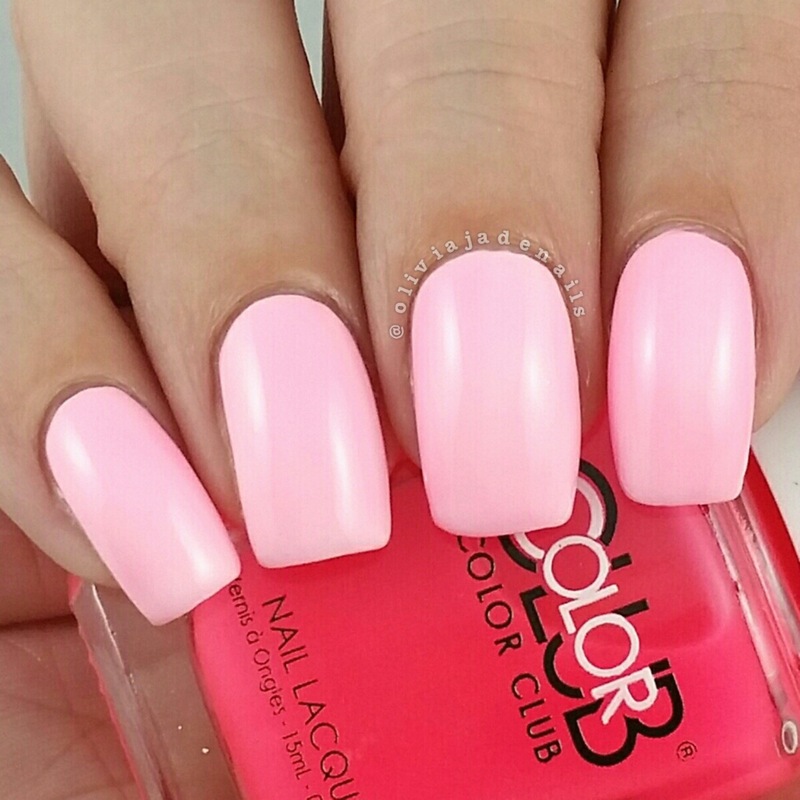 Flushed is a bright coral pink sheer tint. 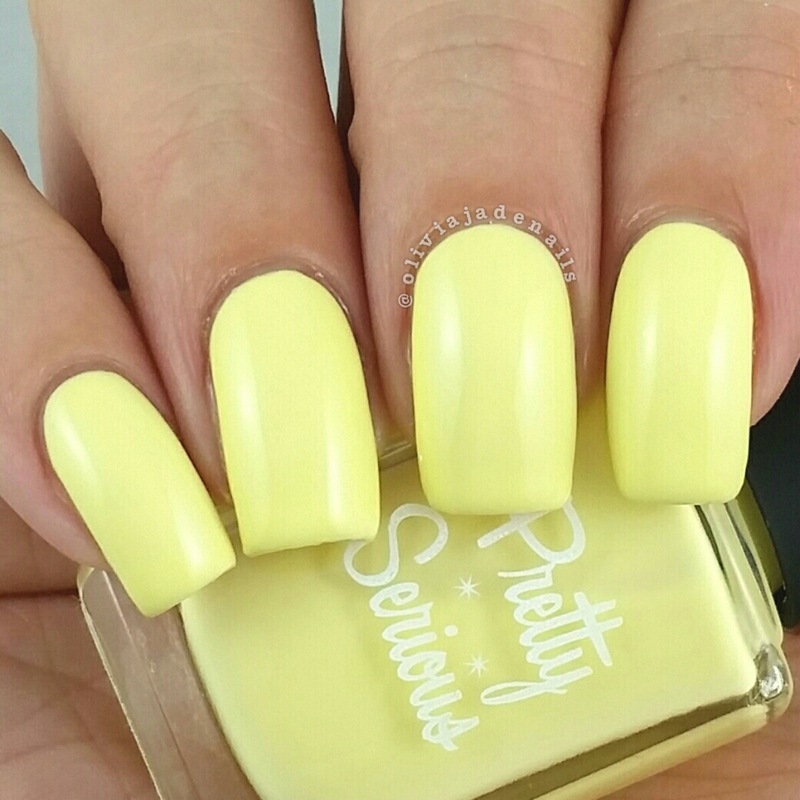 Hello Sunshine is a neon yellow sheer tint. Just Dew It is a neon green sheer tint. 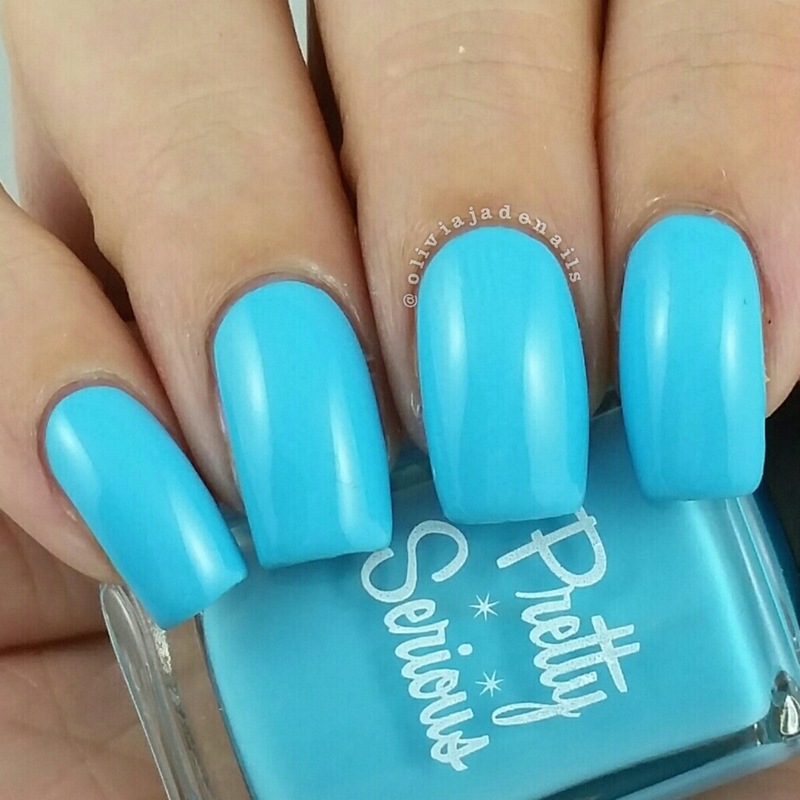 Out Of The Blue is a bright blue sheer tint. Tube Top is a bright pink sheer tint. 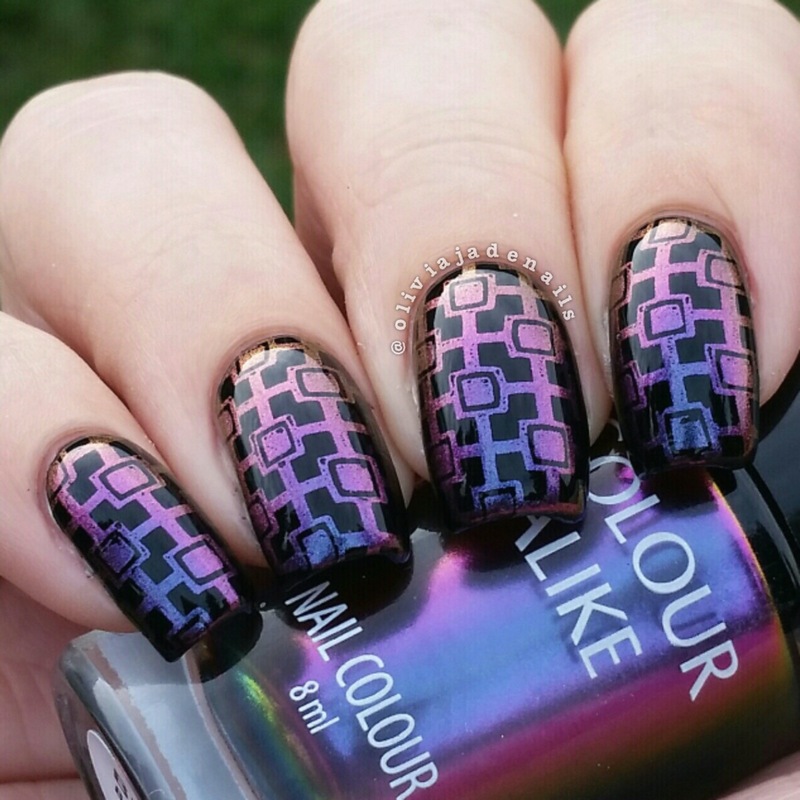 Uncorked is a bright purple sheer tint. I'm in love with this collection. I think that these would have to be my favorite sheer tints that I own. They have a great consistency and are so easy to work with. 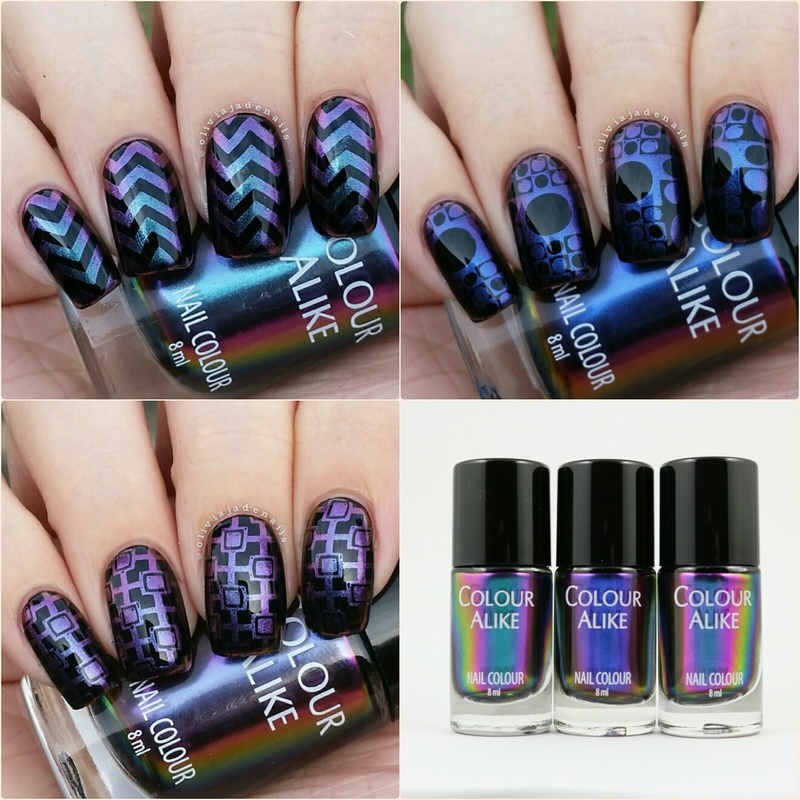 I am working on a nail art post using these so you can get an idea of how they look. 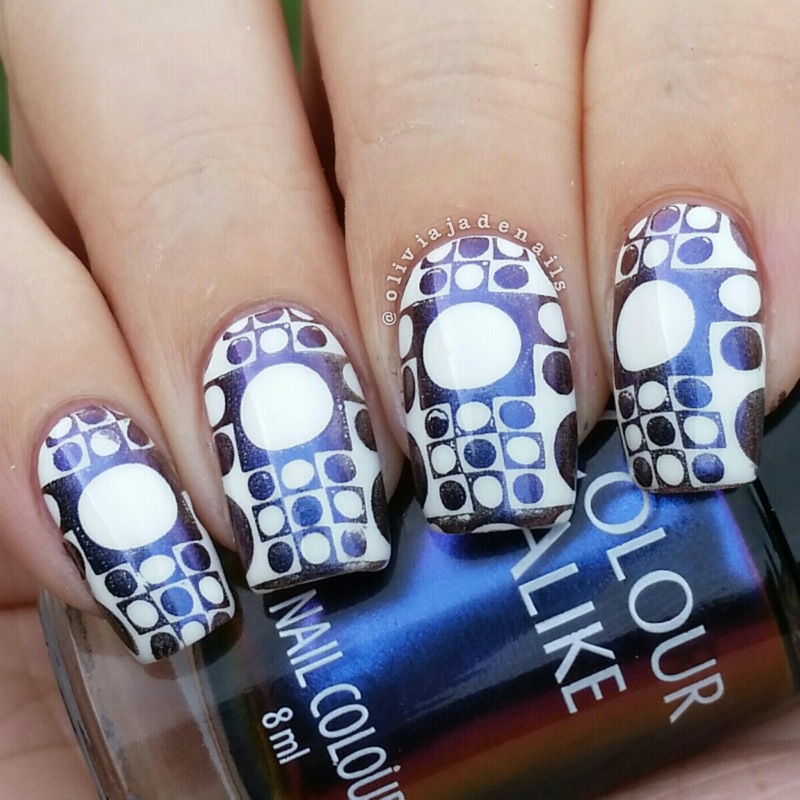 I have been on the hunt for some creme stamping polishes for a little while now. My stamping polish collection mainly consists of metallics and while I love the look of them in person, they just don't look as good in pictures. 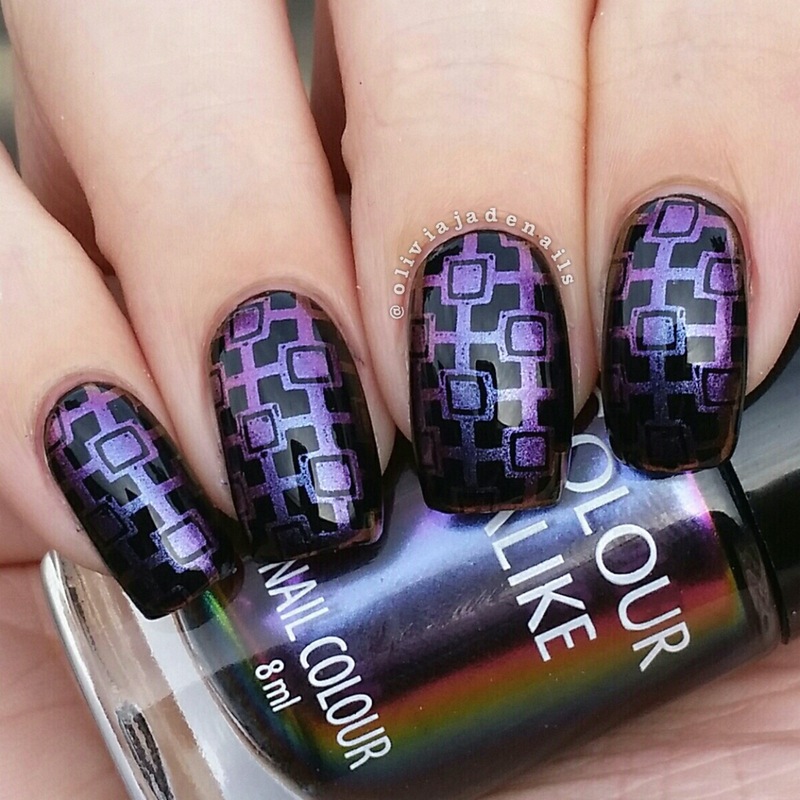 I have been eyeing off and have heard some great things about the B.Loves Plates/Color Alike stamping polishes so I took the plunge and purchased some (I will be doing reviews on those in the next few weeks). 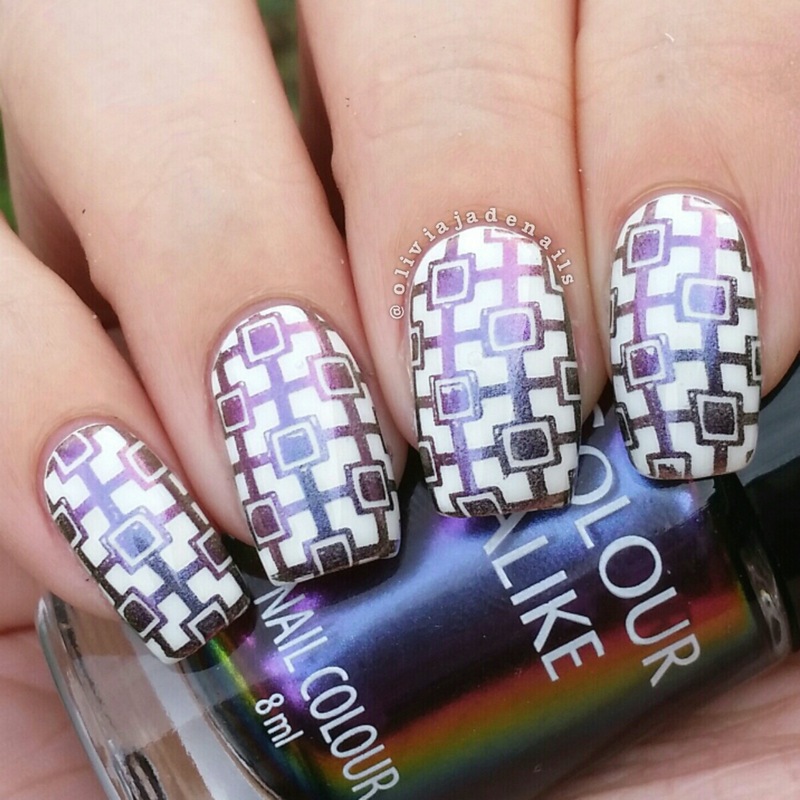 Just before I made my purchase I saw that they had multichrome stamping polishes!! My heart skipped a beat and despite the big price tag I added them to my cart and didn't look back. Now I have them to share with you. While there is only three polishes in this collection, the post is quite picture heavy. B. 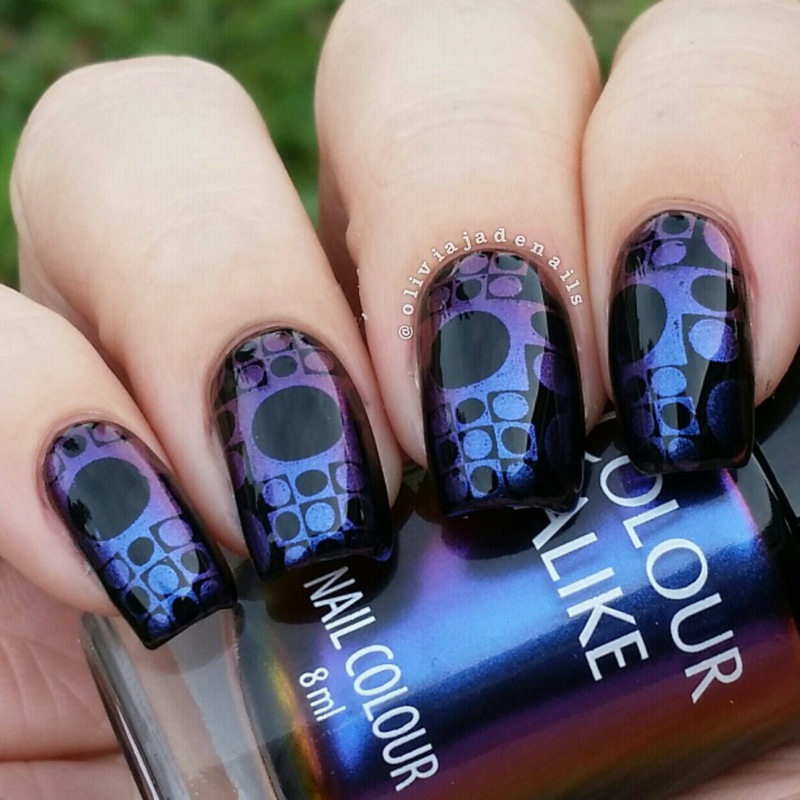 A Lagoon is a multichrome stamping polish that shifts from purple, green, red and gold. B. 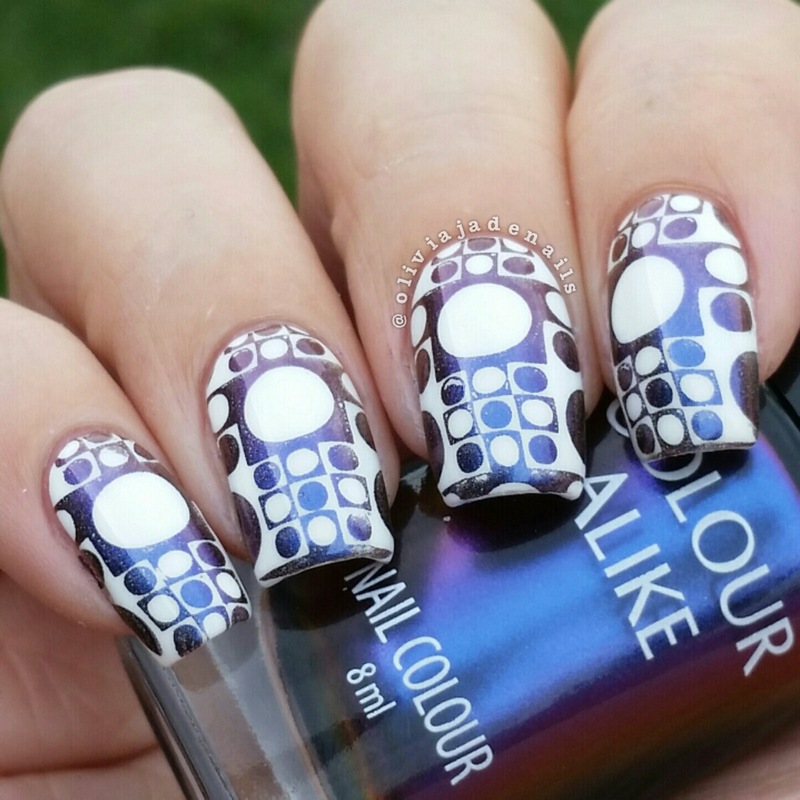 A. Milky Way is a multichrome stamping polish that mainly shifts between ultramarine and purple. B. 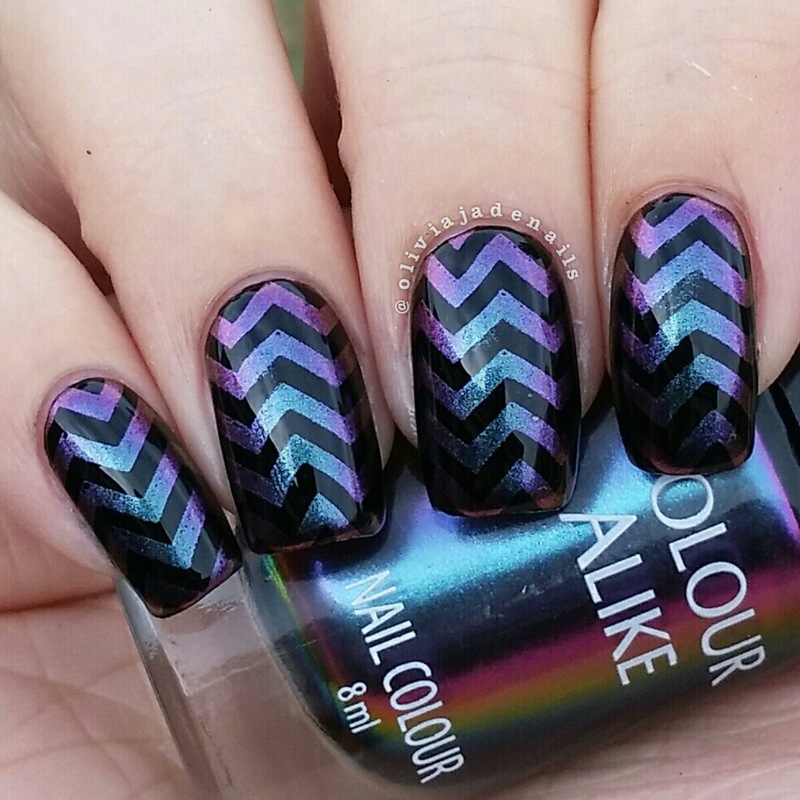 An Orion is a multichrome stamping polish that shifts between blue, purple, red and gold. Overall I like these polishes but I don't love them.. They look amazing in the bottles and look great over black, but the colour shift really struggles over white and I assume other light colours as well. Honestly I think you can get the same look (and cheaper!) 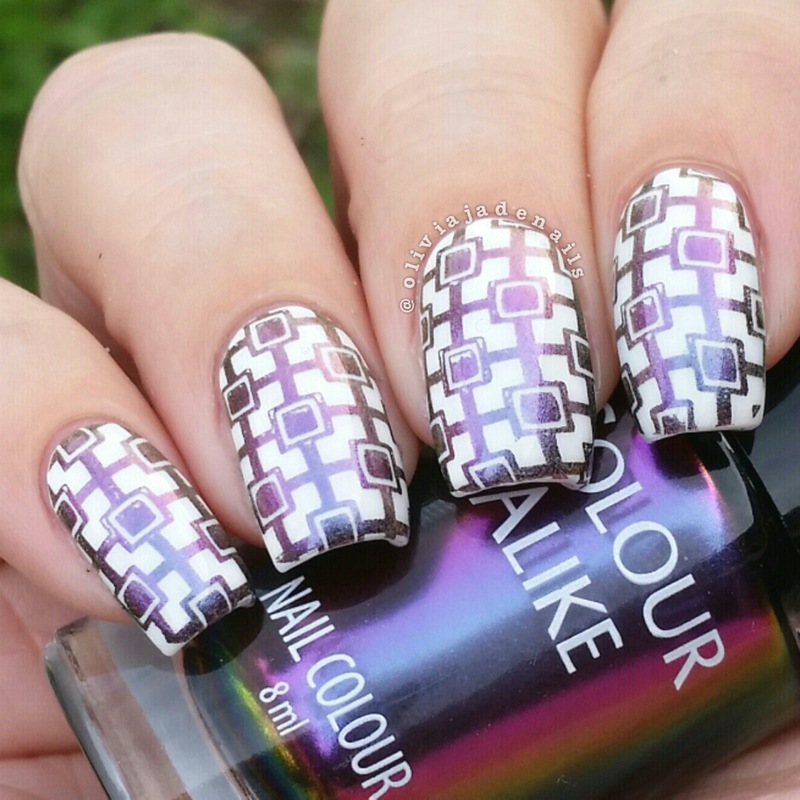 using a multichrome polish and stamping a colour over the top. This collection in my opinion isn't worth the $43US price tag. 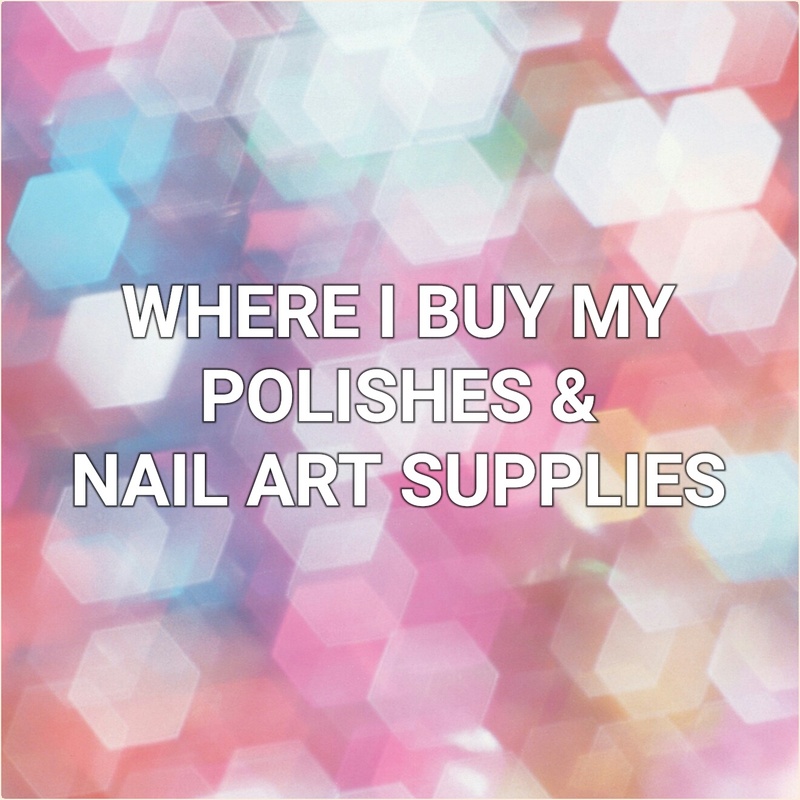 One of the most common questions I get asked is where do I buy my nail polishes and nail art supplies. I was recently asked again in my Facebook group so I thought why not do a blog post with all the details. It will save me going into all the details each time I am asked. This post may be a little lengthy so I do apologize but I would rather have too much information than not enough. I'll split it up into categories so you can just skip to whichever part you are interested in. A little disclaimer before I begin, I have included links to all the stores that I shop at online. I am not affiliated with any of the brands or companies (although I may have been sent press samples from some of the brands mentioned). These are just the places that I shop at now and have regularly shopped at over the past few years. All of the information I have is purely based on my experience and nothing else. Also, if you don't know I am based in Australia so I can't say whether these stores will ship to you or not. Before placing orders anywhere I always do "pretend" orders (eg. fill up my cart with whatever I am after and find out what the shipping is going to cost - each site I am going to mention will let you know how much shipping is before having to officially checkout) at various stores before deciding on where to actually shop. 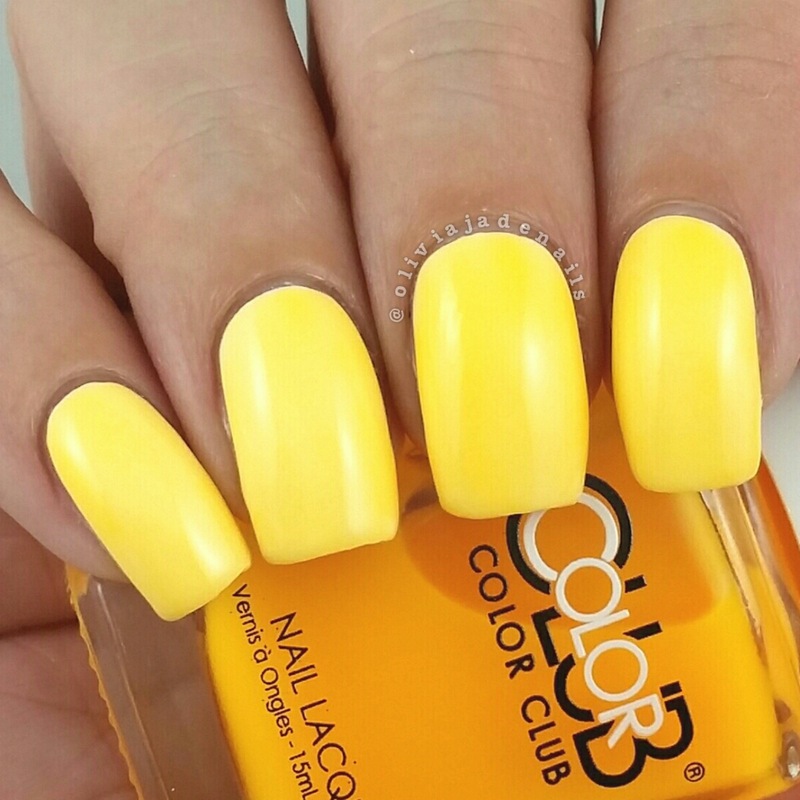 Each store has different price points for polishes and shipping as well. There isn't a huge difference in prices when you get the totals from each of the stores. It's usually around a couple of dollars. Personally I find it best to do "bulk" orders to get the best value for your shipping. So rather than doing lots of small orders here and there I just do a big order every now and again. Right, now lets get into which sites I shop from. Head2Toe Beauty: This is where I buy the majority of the China Glaze polishes from. I would say that at least 90% of my China Glaze's have been purchased here. 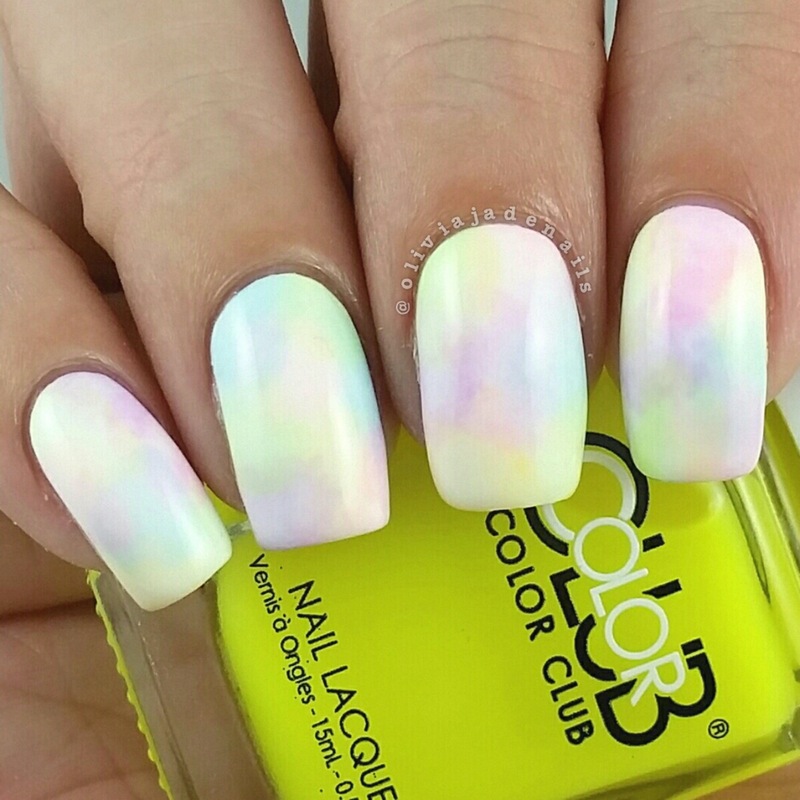 They also sell brands such as Color Club, Orly, Essie, Seche Vite just to name a few. I have purchased all of these brands from H2T before with no issues. Shipping to me has always been one week to two weeks from ordering. For the best value with shipping I always get twenty polishes (or slightly less if I am getting a large bottle of Seche Vite). H2T also offer a 5% discount each month. The code is always listed on their homepage. Nailsupplies.us is my other go to store. They sell very similar items to H2T, however they also stock OPI. You need to create an account (this is free) and you can see the full product range. All of my packages usually arrive within two weeks and I have had no issues. I haven't seen any discounts for this store. I usually get up up to nine polishes from here, but have done bigger orders as well. HB Beauty Bar is a new store that I have been shopping at recently. I have only done a few orders with them so I can't comment too much. In my experience the customer service isn't the greatest, but it's not the worst. 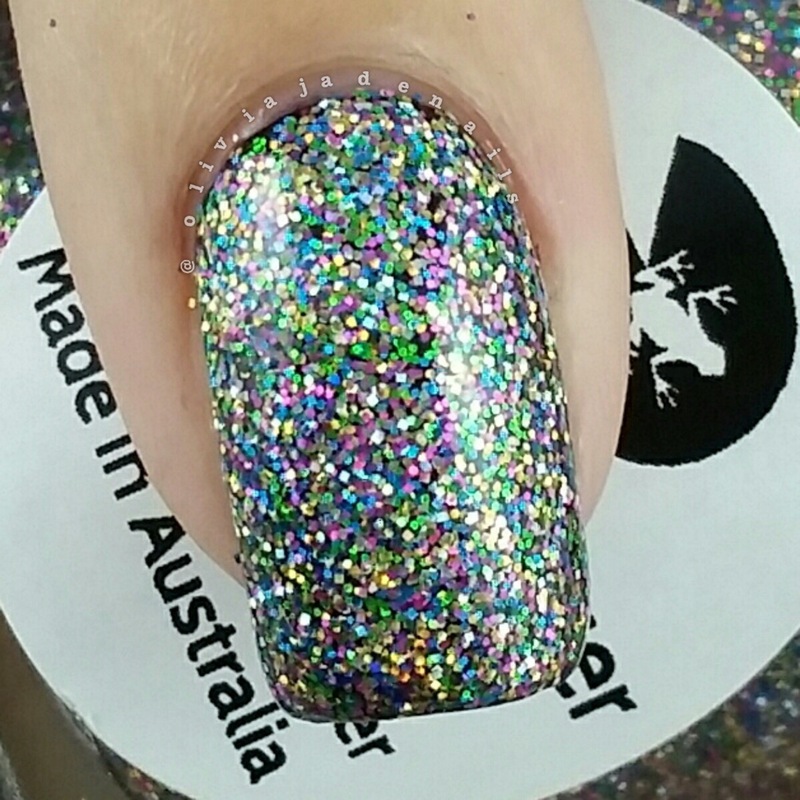 They are one of the sites that actually sell Zoya and ship to Australia. 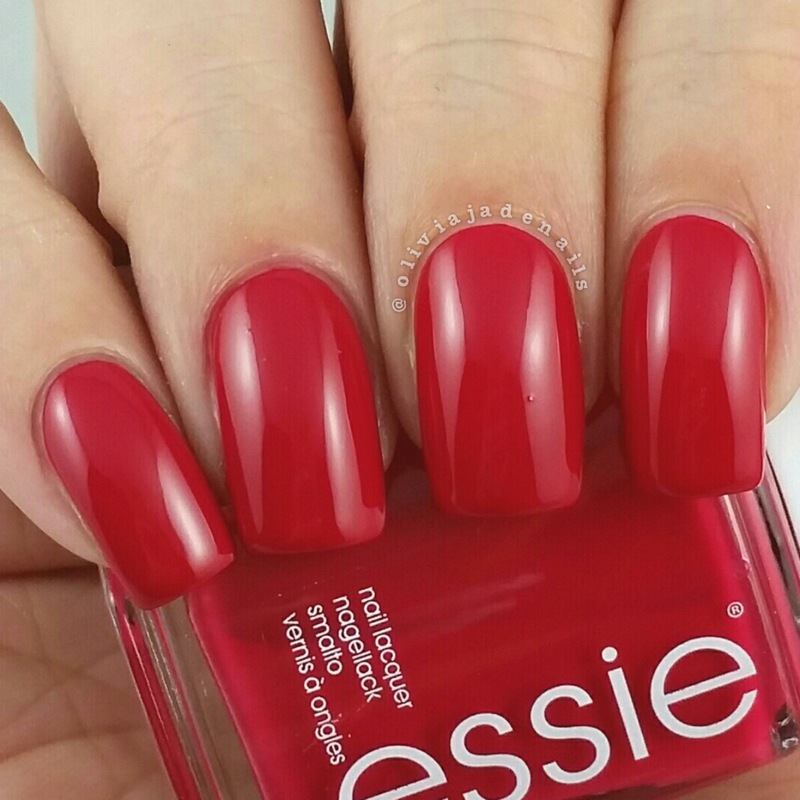 They also have brands like Color Club, Essie, OPI, China Glaze etc. 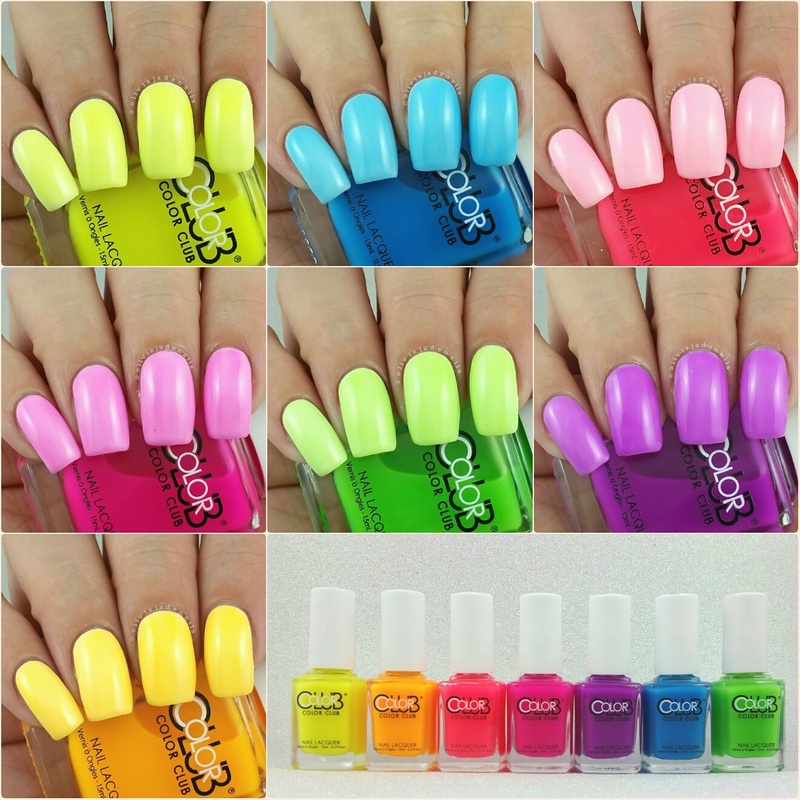 The prices are quite high for the polishes but the shipping prices are quite reasonable especially for bulk orders. You can also find various discount codes for the store as well. Fun fact for you: I only buy Australian indies. I have nothing against the international brands, in fact there are some amazing brands out there with polishes that I drool over. Why don't I buy them? Well when I first started my polish obsession I was strictly OPI only. Then I branched out to the other mainstreams and my wish list was massive but the funds just never matched it. We've all been there. Anyway I then got sucked into the indie world and made the rule that I would buy Australia indies only. I have stuck to that rule to this day. There are of course many, many other great brands out there. Again there are a heap of other brands both that I own or are on my wishlist. The above brands are just where I show at more regularly than the others. The bulk of my nail art supplies (studs, charms, glitters etc) have been purchased from Born Pretty Store. My nail foils have all come from Dollar Nail Art. Nail art tools (dotting tools and some brushes) are from eBay. I also have a few brushes from Winstonia. My biggest tip when shopping (especially for polishes) keep adding polishes to your cart until the shipping costs changes to the next bracket. For example, whether you have seven or nine polishes in your cart you are still paying for shipping for nine polishes so why not add in another two polishes? Of course, it will depend on your budget. But like I mentioned earlier, I find it better to shop in bulk and buy less often than buy regularly and only get a few polishes at a time. That's just me though. Right I think that covers about everything. I hope it makes some sense and helps you. If you have any questions or want some more information on anything just let me know (comment below, email me, ask me on Facebook or Instagram). I am happy to help where ever I can. 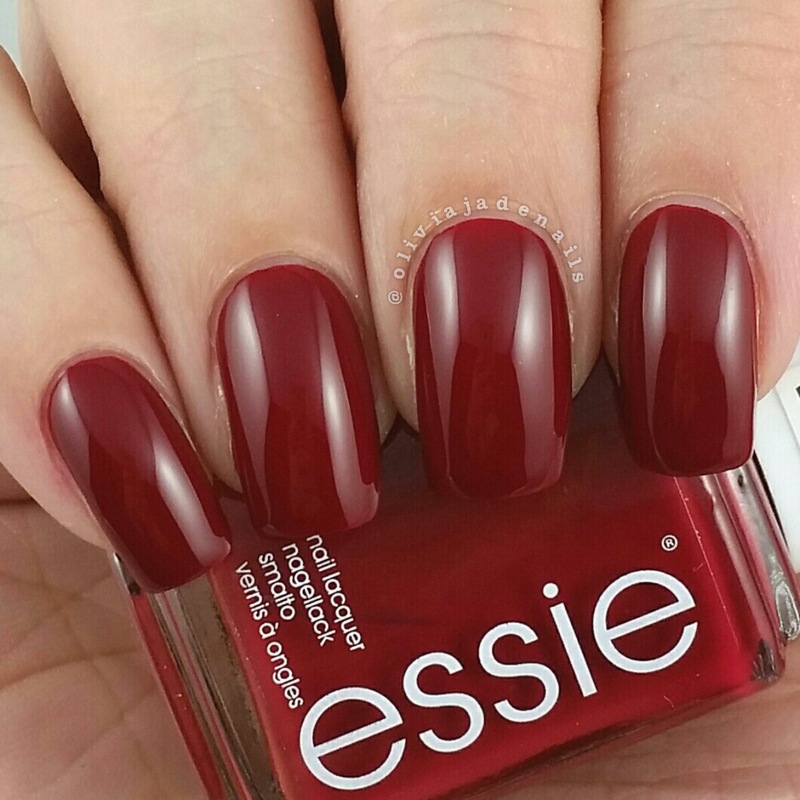 I was just thinking the other day that Essie would be due to release another new collection here in Australia. Next thing you know there is a knock at my front door with a lovely delivery man with the brand new Essie Winter Collection. Definitely a great surprise for me. Anyway the Winter Collection features six polishes in a variety of shades and finishes. Before jumping I should note that this collection was released in Winter 2015 for those of you in the US (and maybe in other countries) so you may have already seen these and even own them. Right, now onto the swatches. Altitude Attitude is described as a scarlet creme. The formula of this one is great and applies really evenly. I used two coats for my swatch. Apres-chic is described as a iconic platinum. 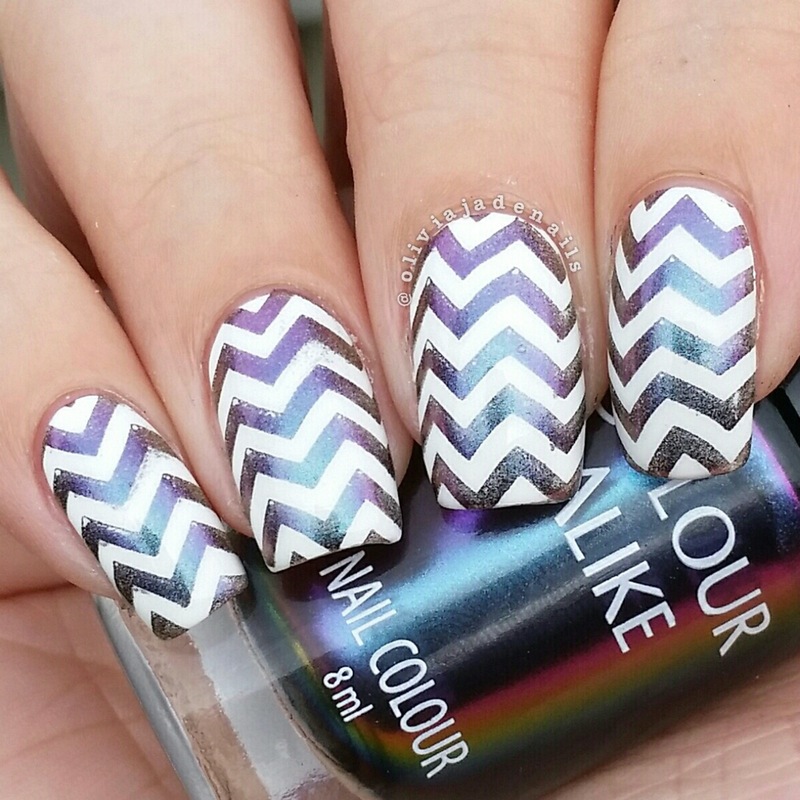 Another polish with a great formula. My swatch shows two coats. Haute Tub is described as a jet black with amethyst fire. I was a little disappointed with this one. In the bottle it looks really purple and sparkly, but on the nail it pretty much just looks black, even in direct sunlight. Not that there is anything wrong with that, I just would have preferred it to be more purple and sparkly. 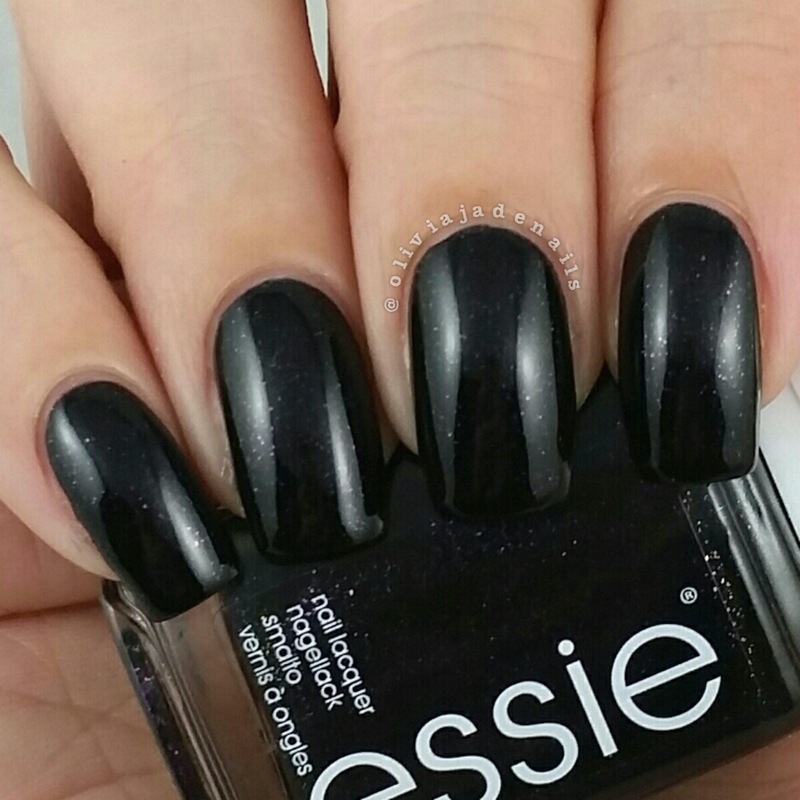 The formula is easy to use and is opaque in two coats. 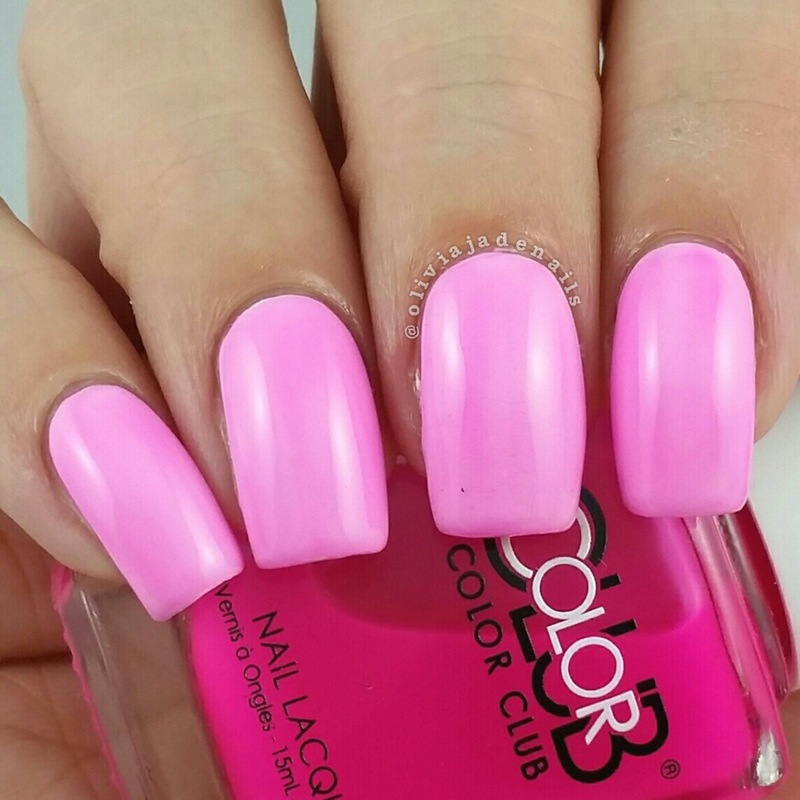 Peak Show is described as a powder pink. 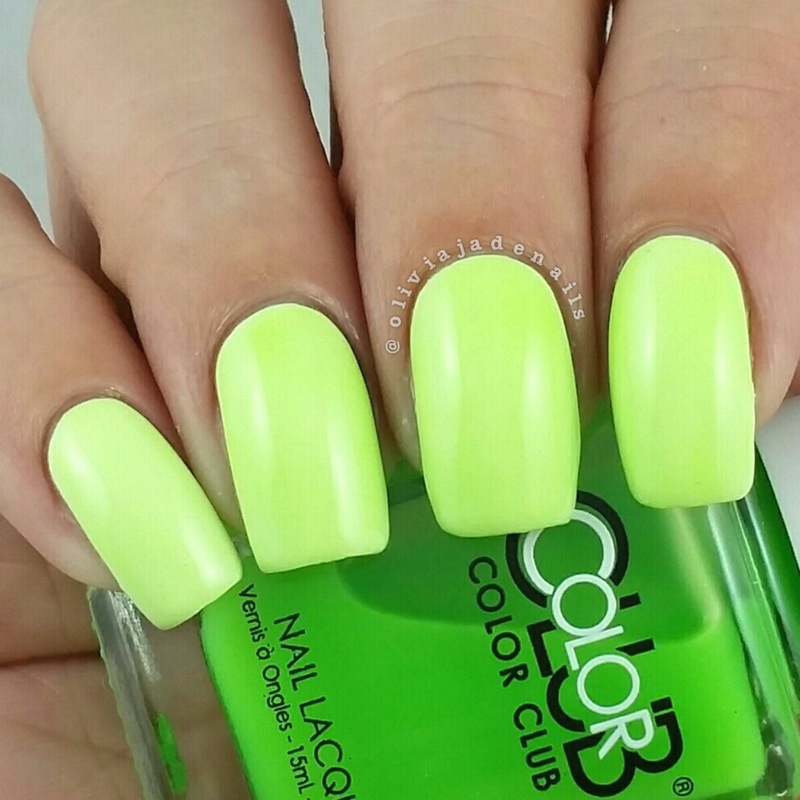 I think this colour is really pretty and fresh. I really like these really light pinks at the moment. 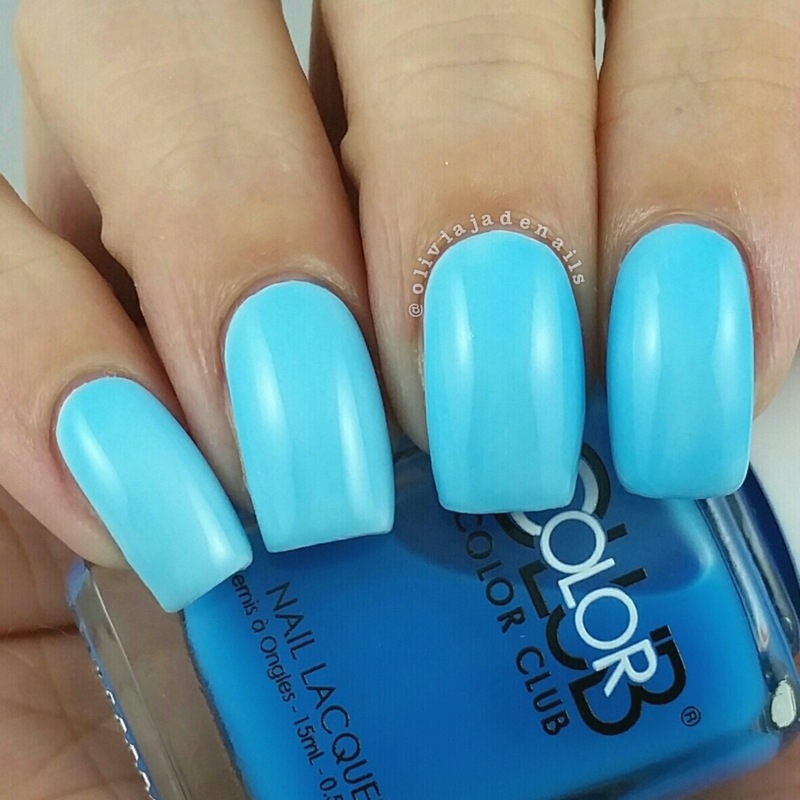 The formula doesn't apply a little unevenly and needed three coats to even out, but that is expected for such a light shade. Shall We Chalet? is described as a seductive ruby. The formula of this one is fantastic. 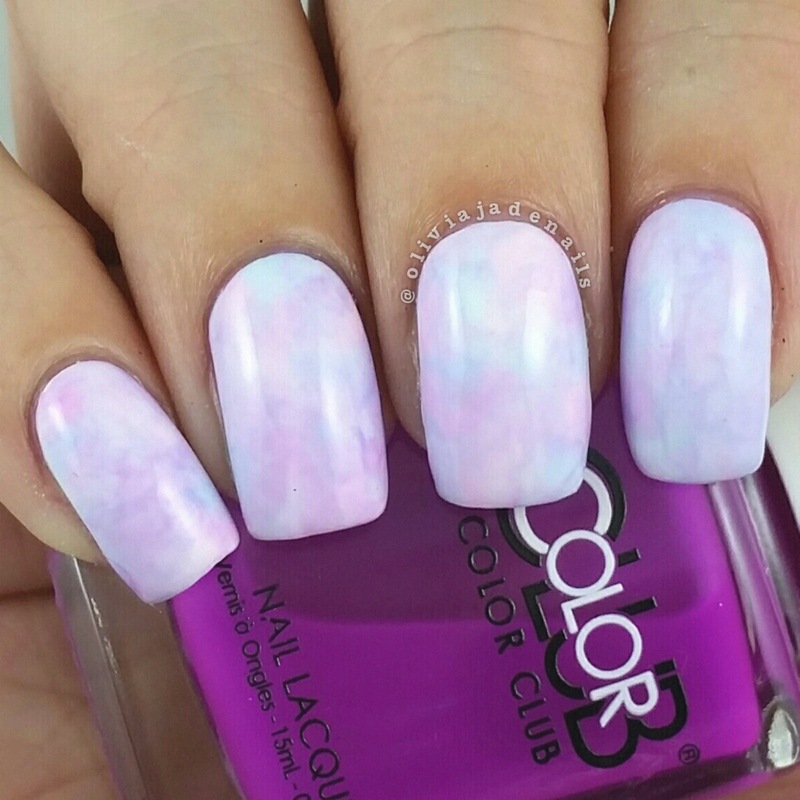 So easy to use and is opaque in two coats. 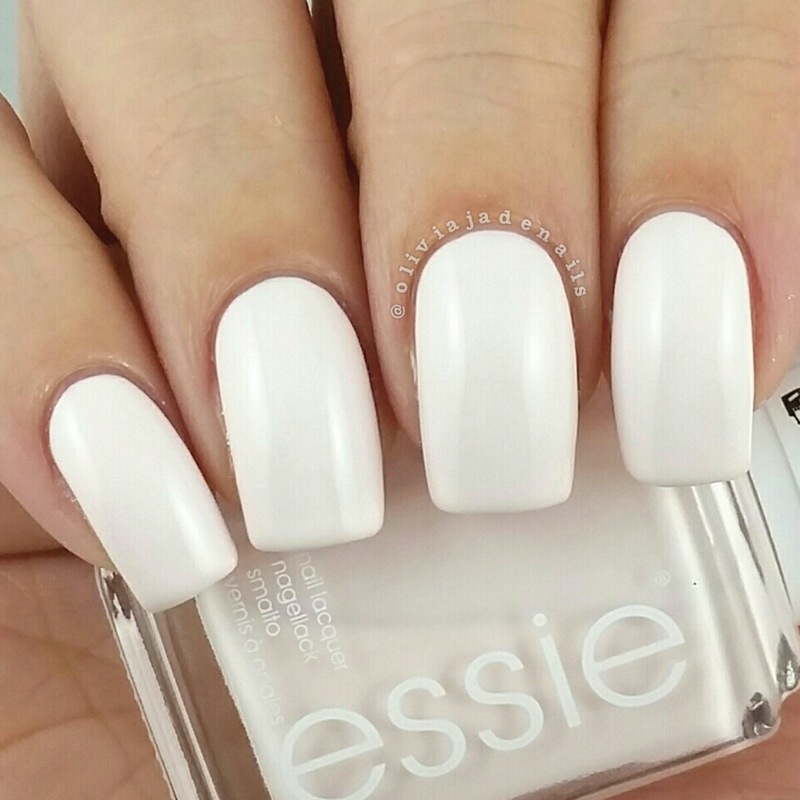 If you have shorter nails and are in a hurry you could get away with one coat. Virgin Snow is described as an icy frozen lavender. 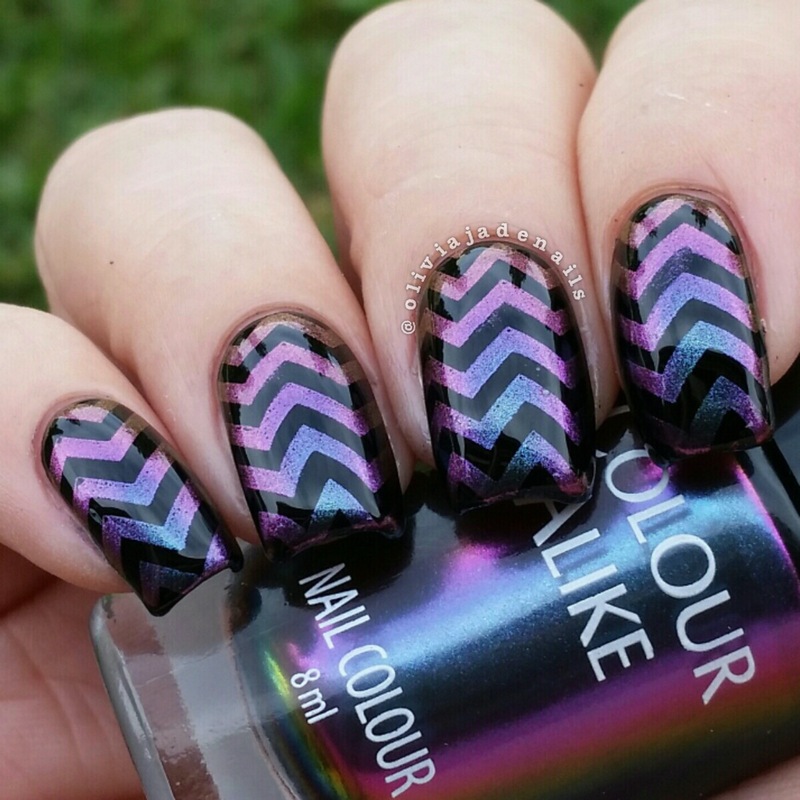 Now this polish is right up my alley. 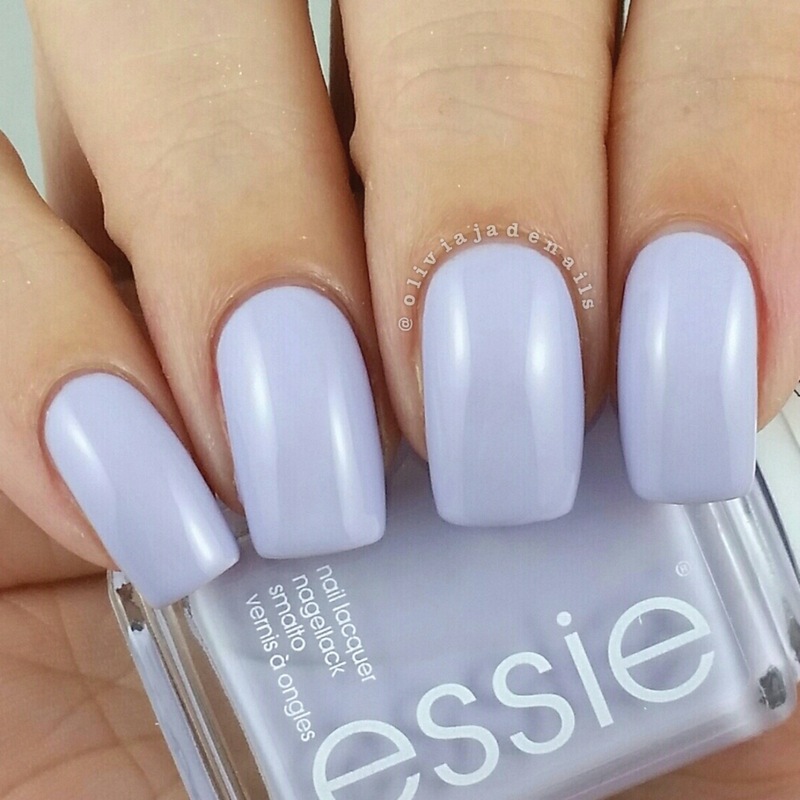 It's a purple creme, really pretty and the formula is great. It applies like a dream. My swatch shows two coats. Overall I really like these polishes, however I am not entirely sure they work together as a collection. Maybe that's just me though. My personal favorites are Virgin Snow and Peak Show. Surprisingly, I quite like both of the red polishes (I'm not a red polish kind of girl). I even wore Shall We Chalet? as a full mani. 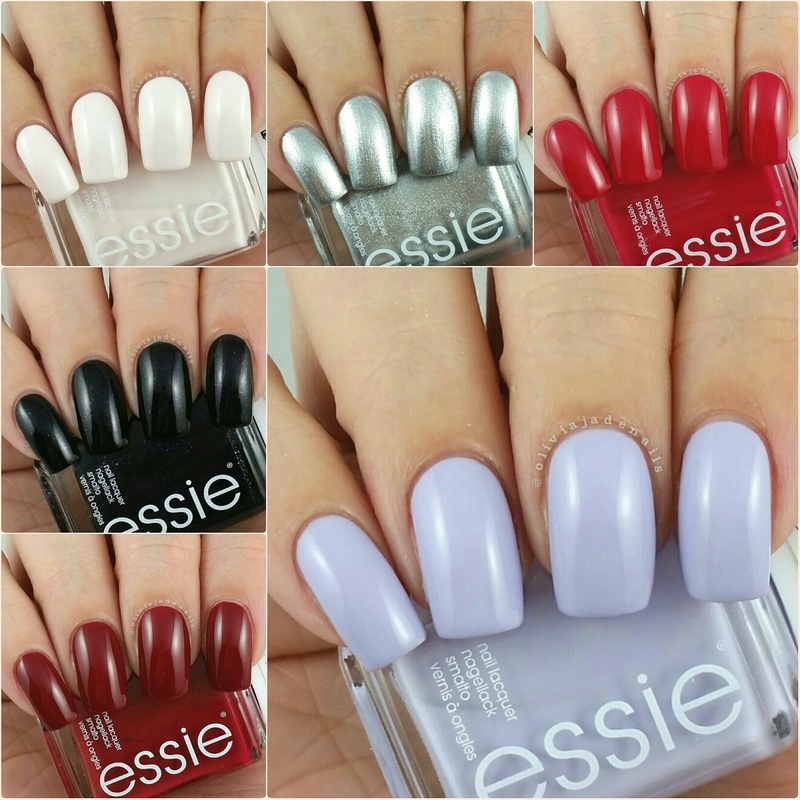 I believe that the Essie Winter 2016 Collection is limited edition and is available now. 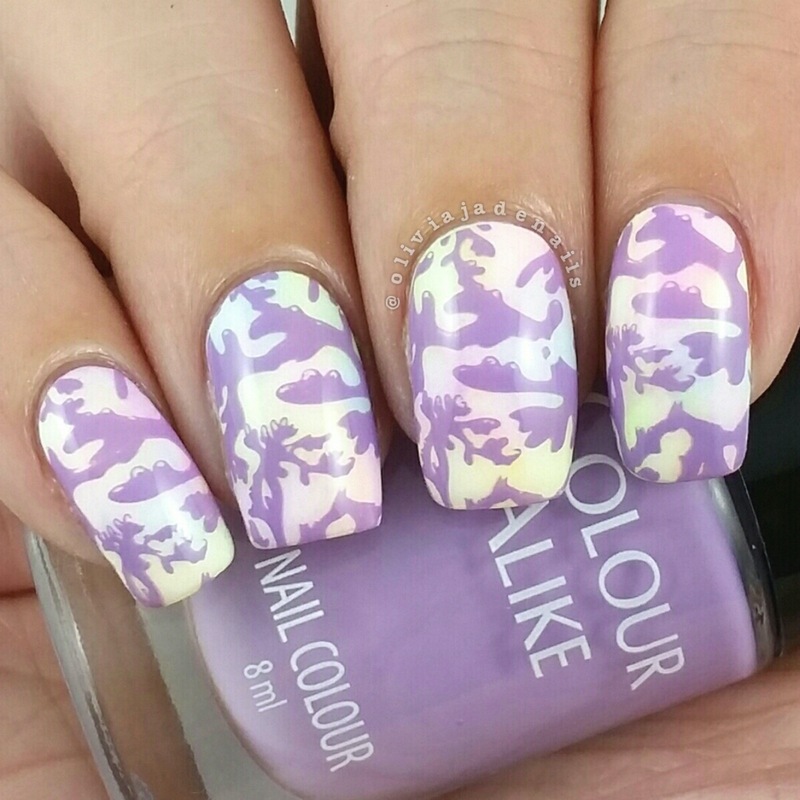 Will you be grabbing any of these shades? Uberchic Beauty have recently added two new mini stamping plates to their ever growing stamping plate collection and I just so happen to have them to share with you today. 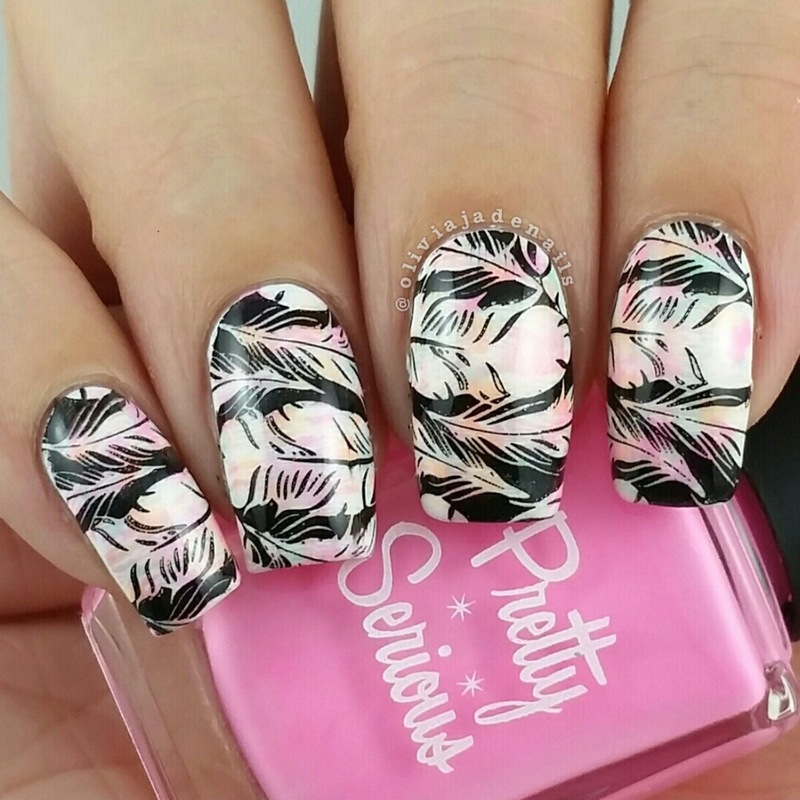 Both the Fabulous Feathers and Nautical mini plates feature a mix of full nail images and small individual images. I'm going to have to say that this plate is my favorite of all the mini plates that Uberchic has released so far. I am such a huge fan of the designs and can see me using it a lot. The images all pick up and transfer to the nail well. 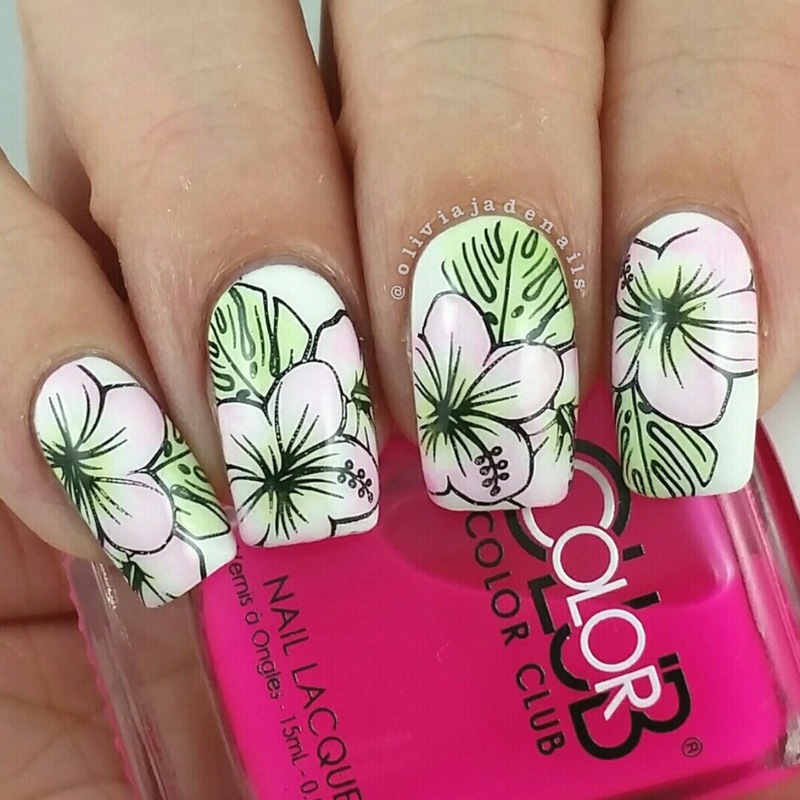 This plate will particularly be good for nail art challenges. It's not a plate that I can see myself grabbing for a lot (mainly because I don't do nautical nails very often at all) but it's a good one to have in my collection. 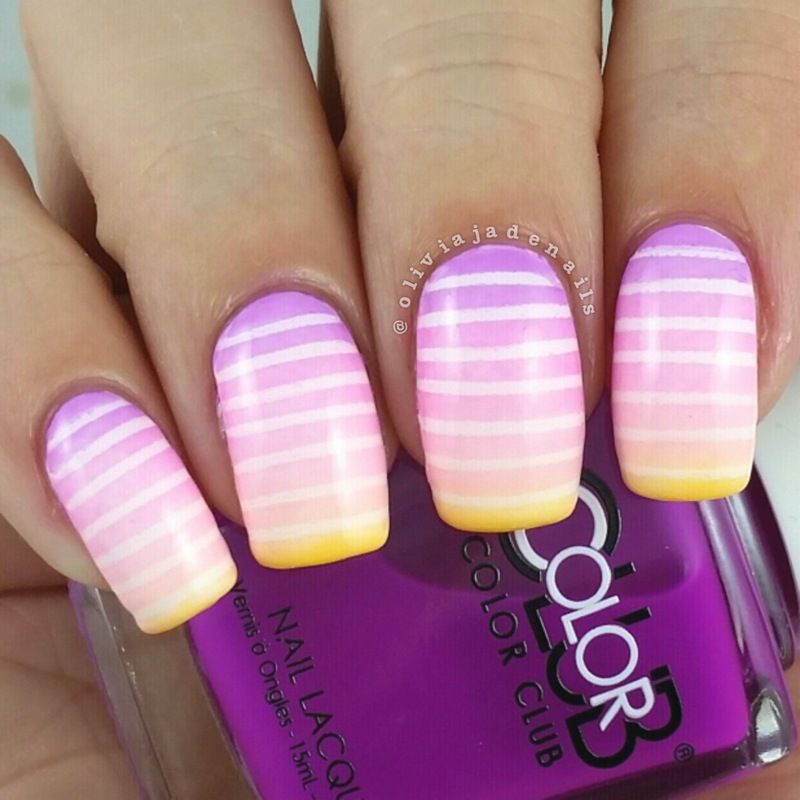 I wasn't feeling like going for the typical nautical/beachy colours, so I went for a more rainbow look instead. The images pick up and transfer well. Like all of the other Uberchic plates I own, these plates pick up and transfer the images well. I have had no issues what so ever. I like that both plates offer a range of full sized and smaller images. The mini plates are all available from Uberchic Beauty. I am going to start this post by saying how much I love the new Pretty Serious Cosmetics Pastel Bright Pet Names Collection. The collection consists of six bright creme polishes (personal I would call them pastels - they are more along the line of light brights) and they are gorgeous!! Let's take a look shall we? The formulas across this collection is very similar. They all apply well and are opaque in two coats. All of my swatches show two coats and the pictures are taken in my light box. Bunny-Foo-Foo is a mint creme. Such a pretty colour. 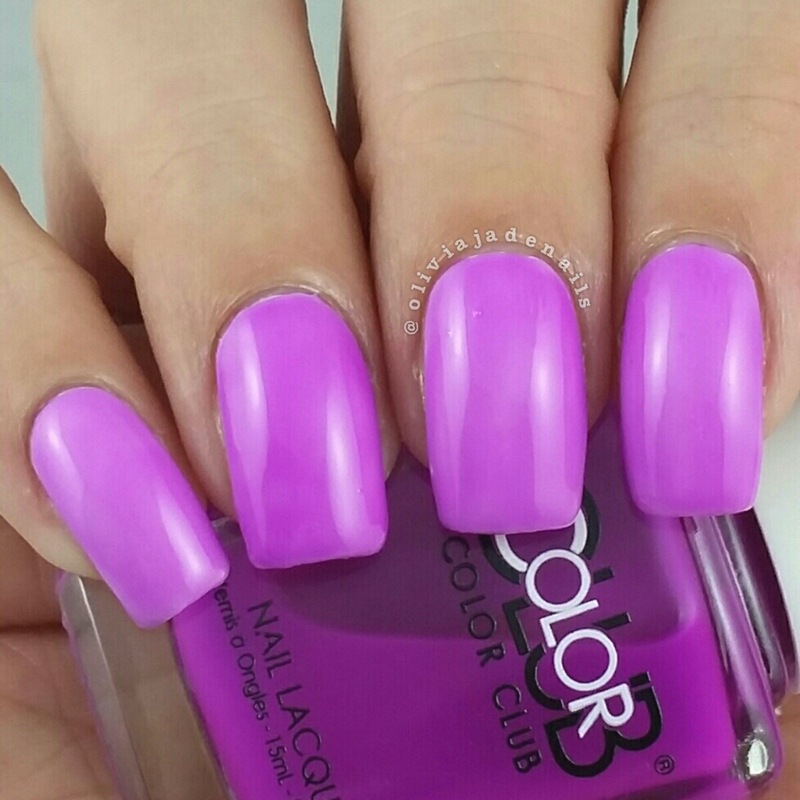 Cutie Patootie is a a bright purple creme. I love this one - but is that a surprise? 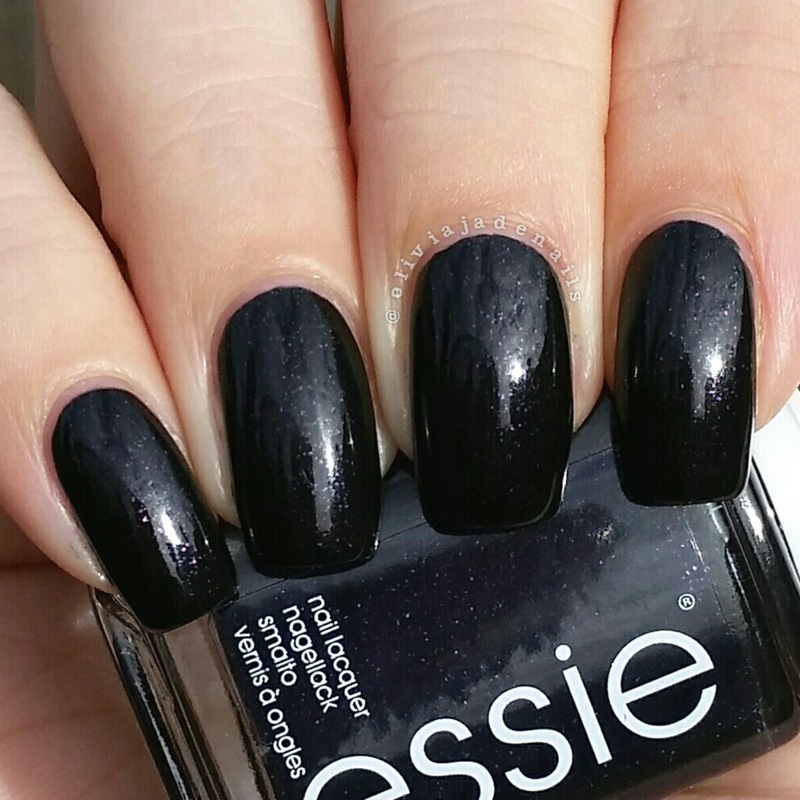 The formula is surprising opaque and applies really evenly. 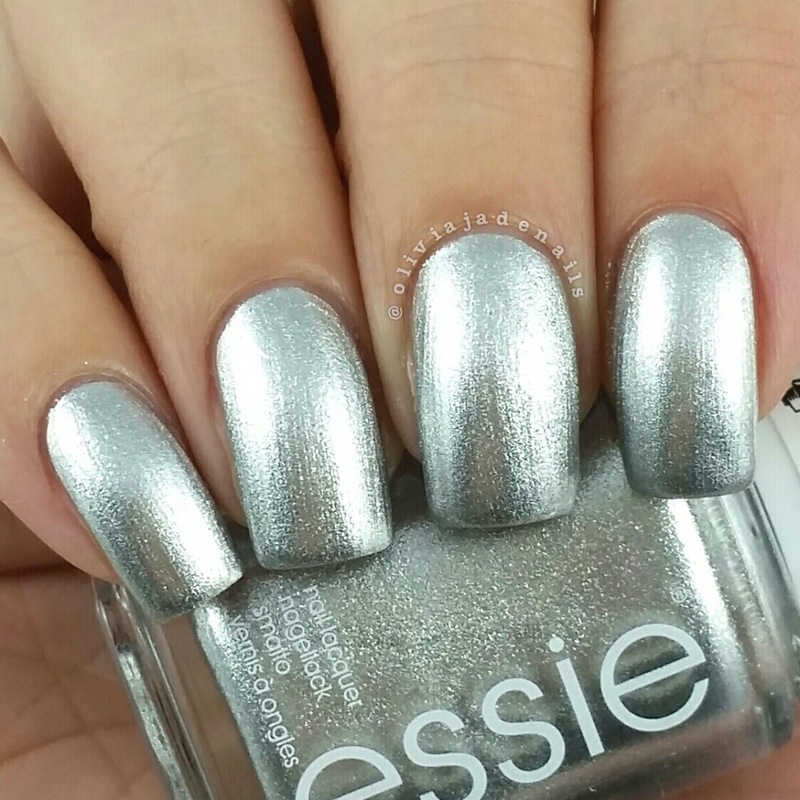 If you have short nails and are in a hurry I think you could easily get away with one coat of this one. Doodle Bug is a bright blue creme. The formula is the same as Cutie Patootie and the colour is amazing. Fluffykins is a bright pink creme. Stunning colour! It's super bright and is a deeper colour than it looks in my picture. My camera freaked out and washed it out sadly. The formula of this one is quite thick but it is easy enough to work with. Personally I will be adding some thinner to mine. 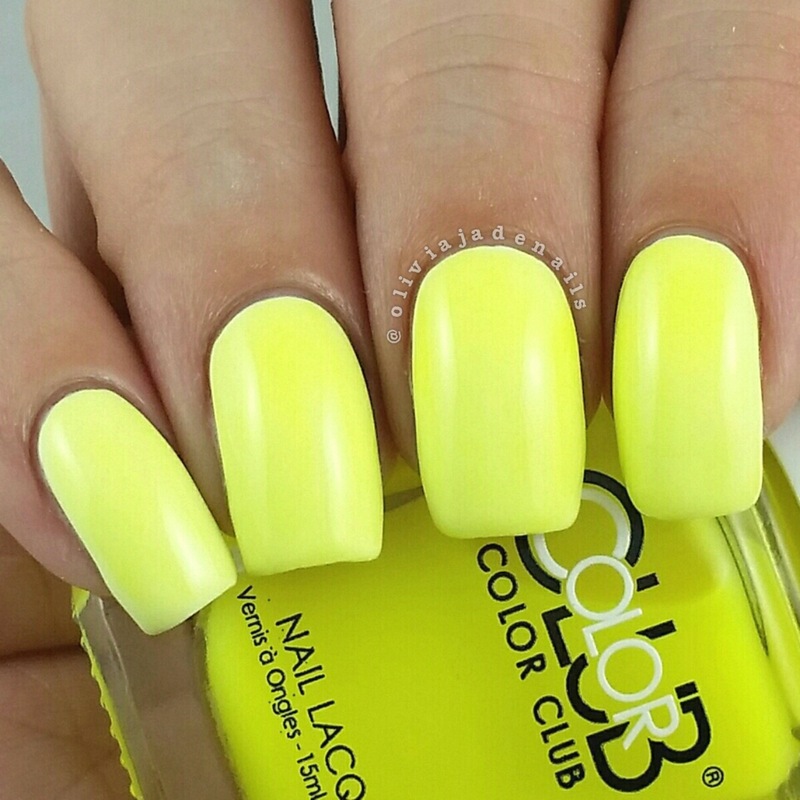 Little Duckling is a bright yellow creme. This one is probably the most pastel of the collection. Pretty colour. 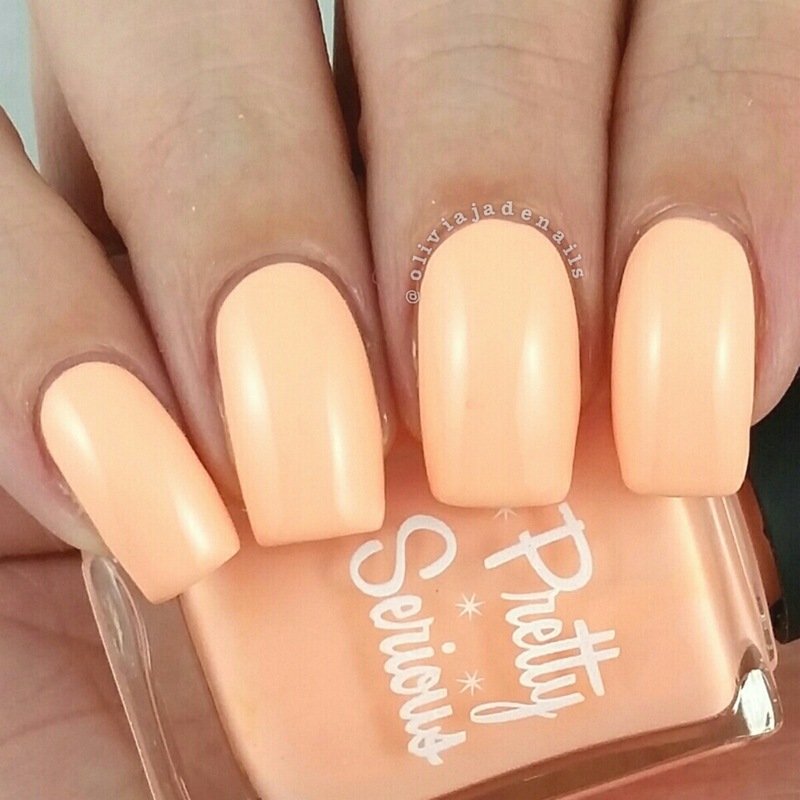 Peachie Poo is a bright orange creme. Now this one did not photograph accurately at all. It is definitely not pastel looking at all in person. It must have some neon magic in there that freaks out the camera. It's such a great colour. Seriously I am in love with this collection. I would have to say that it is my favorite collection that Pretty Serious Cosmetics have ever released. The formulas are great and the colours are amazing. If you like bright polishes then I definitely recommend this collection. I had a quick look at the Pretty Serious Cosmetics website but I can't see this collection on there so I am not too sure when they will be available again. Definitely keep your eyes out though. It's been a very busy blog week for me this week. I think this may be the first time I have ever blogged for a full week. Anyway, today is just a quick little blog post to let you know that I have set up a Facebook group for my blog/Instagram. I hope you come and join me. I would love to get to know more of my readers and hopefully you get to learn more about me. You can join the group here or you can click on the Facebook social media icon on the right of my blog. The Tumblr social media icon now takes you to my Facebook page instead. Today I have another Lilypad Lacquer post for you and this one will be a quick post. I was recently shopping at Beauty So Fly picking up some Femme Fatale Cosmetics exclusives when I stumbled upon some other store exclusives that I just had to add to my cart. You know, for safety reasons. Plus it makes shipping seem more reasonable. Any justification will do for this polish! 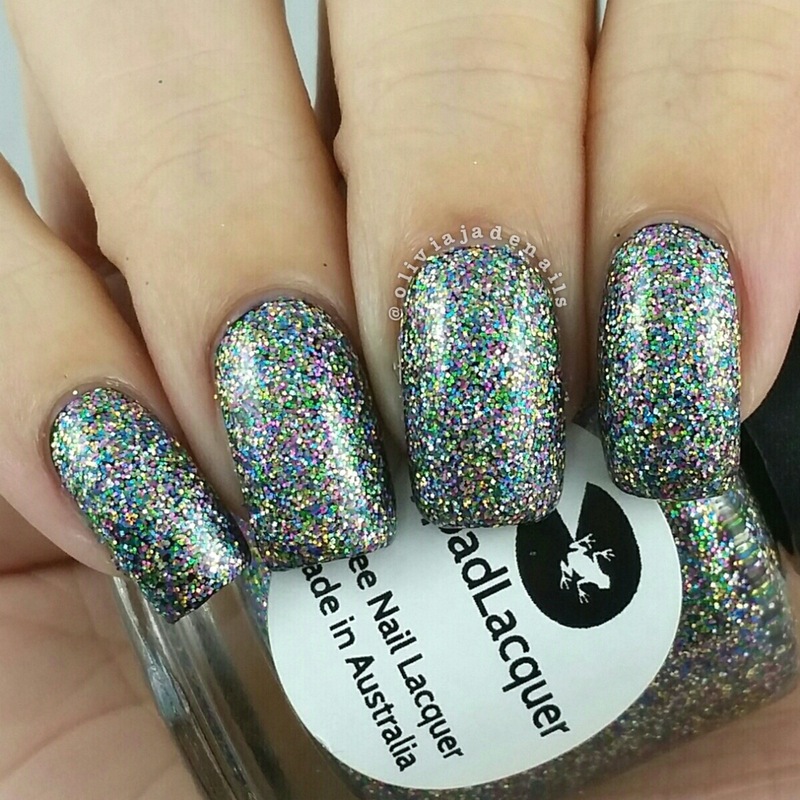 Fireworks is a multicoloured micro holo glitter, with silver, gold, fuchsia, green, blue colours! I wish that you could just see how sparkly this baby is. It's absolutely gorgeous. I am a huge fan. It's easy to use, has soooooooo many colours plus it super sparkly. Love, love, love. I used two coats over black for my swatch, but honestly I think three coats on it's own would be perfect. I really don't know what else I can say about this polish. 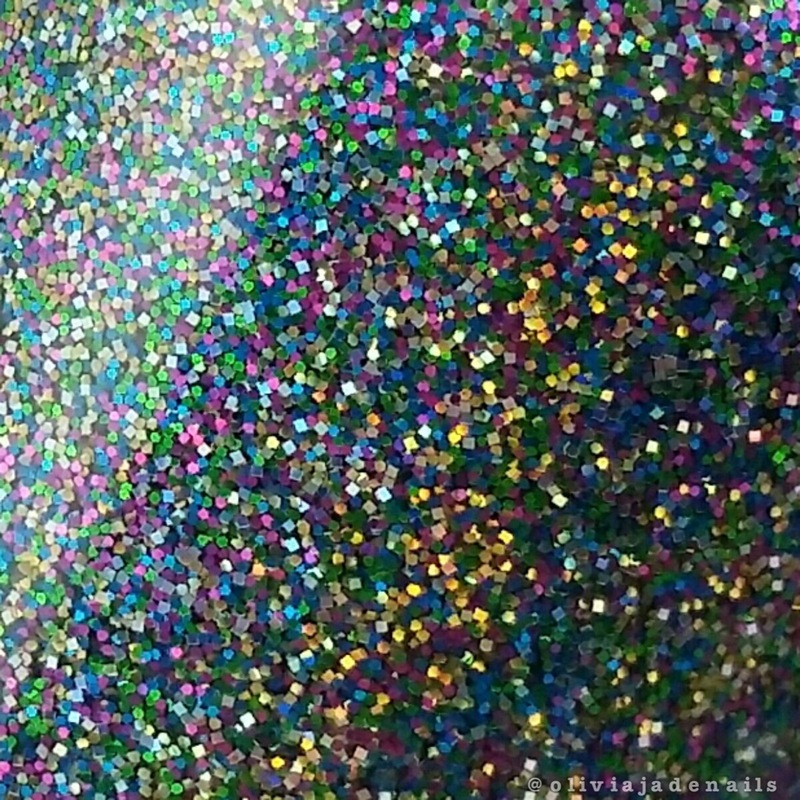 It's amazing and I think everyone who likes glitter should own it. Fireworks is sold exclusively from Beauty So Fly.